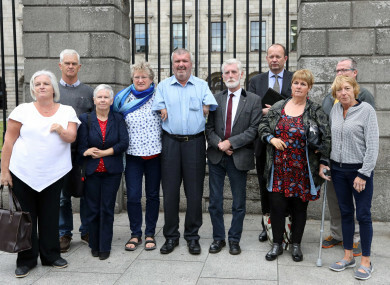 Representatives of Thalidomide Ireland outside court last week. THE HIGH COURT has adjourned several claims for compensation over the use of the drug Thalidomide to a date in November for further case management. Twenty-six cases are being brought against the manufacturers of the drug German firm Grünenthal GmbH, the Irish distributors TP Whelehan Son & Co, and the Ministers for Health and Environment. Launched as a sedative in Germany in 1957, it is alleged the drug caused deformities in unborn children when it was given to their pregnant mothers. The alleged wrongdoing dates back to the 1960s. All of the defendants deny the claims. The actions have been case managed on their way to trial for the last few years and a preliminary issue to be determined in the actions is whether the cases are statute-barred. At the High Court today the cases returned before Mr Justice Seamus Noonan, who has expressed his concern about “the slow pace” of the proceedings. Judge Noonan ruled on several requests made by the defendants that the plaintiffs further particularise and answer questions about certain aspects of their claims. The defendants claim they require the information from the plaintiffs in order to fully meet the claims against them. The judge said the defendants were entitled to most of the further particulars that they sought. He said the details sought are to be provided in advance of when the matter returns before the court for further case management on 7 November. He said in his ruling that the plaintiffs had a right to seek to discover documents from the State as part of their claim. Judge Noonan added that he would also deal with other preliminary matters, including the discovery of relevant material and issues over expert reports, when the matter returns before the court. Earlier the court heard that lawyers for the plaintiffs claimed there were difficulties in obtaining medical records to progress the cases. They also claimed the defendants were causing delays by making various applications in advance of trial. In a statement issued after the ruling, the Chairman of Thalidomide Ireland, John Stack, said the organisation, “on behalf of its members both alive and deceased”, was pleased to know that the plaintiffs had a right to discover State documents. “Unfortunately, two of our members have not survived to conclude their court actions against the Irish State … Our members are ageing, becoming more decrepit and suffering the adverse effects of their physical deterioration. Our litigation has been the mother of all battles over decades and Thalidomide victims have to keep themselves alive to get justice for both their families and themselves. “That is fundamentally wrong and shows that the State’s moral compass in respect of catastrophic injury litigation is incorrectly set for the purpose of minimisation of costs rather than doing the correct thing by its injured citizens,” he said. A spokesperson said the Department of Health “can’t comment on an issue that’s the subject of ongoing litigation”. In a previous statement, a spokesperson for Grünenthal said the company was “deeply sorry for what happened to those affected by the thalidomide tragedy”. “It’s important for us that we engage in efforts to improve the situations of those who are still living with the impact of these latter effects. Email “Thalidomide group welcomes right to discover State documents in 'mother of all battles'”. Feedback on “Thalidomide group welcomes right to discover State documents in 'mother of all battles'”.